HMS Good Hope was a Drake Class armoured cruiser and in August 1914 she became the flag ship of the 4th Cruiser Squadron commanded by Rear Admiral Craddock which sailed to the South American coast to search out German raiders. 4th Cruiser Squadron was then sent to find the German East Asia Squadron and prevent them from entering the southern Atlantic. 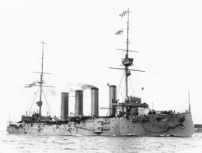 On 1st November 1914 the two opposing squadrons came face to face off the coast of Chile in the Battle of Coronel. The German squadron was bigger and its ships were more powerful and in the ensuing battle HMS Good Hope was lost with all hands, including 90 men from London.